The DijonStock Digital Home Recording Support Forum • View topic - Midi implemtation charts ? WTF ? Midi implemtation charts ? WTF ? 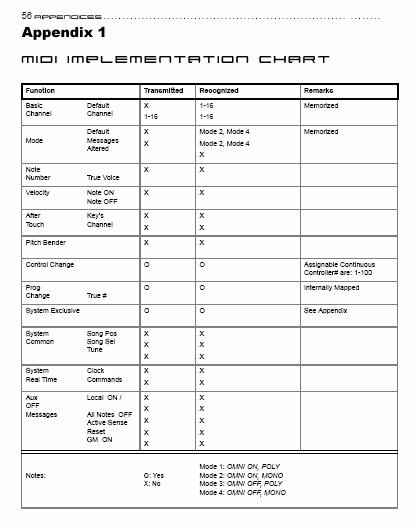 Post subject: Midi implemtation charts ? WTF ? You've all seen 'em and flipped right past them to the end of the manual of the device. Me too 'till I figured out how handy it is. 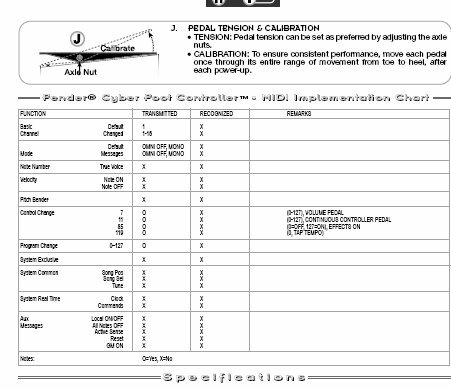 It is required information for each type of midi device. No Midi implemtation chart ? No can sell it new in the US. It's a part of MIDI that remains unchangerd after it's 35 + years of history. We will refer to this section many times in the future. Let's start with a simple one. First the MIC for the Fender Cyber-Twin Amp. I always read one of these from the bottom up first . Why ? Because the actual keys to understanding the chart are there. This one is no exception. 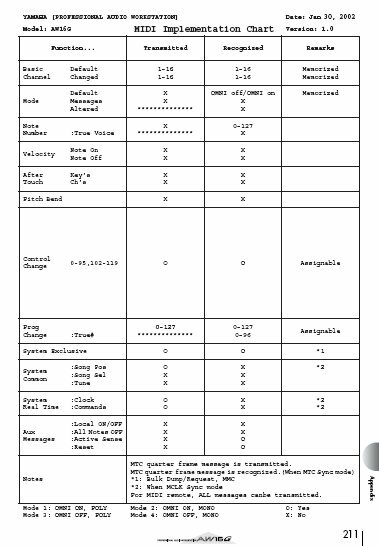 The notes section shows the symbols used in the chart. X means NO , O means YES. Notice also there are 4 special conditions or modes as they are sometimes called. Omni in this case means all midi channels at once. Poly / mono mean more than one midi message can be transmitted or RX'ed . mono means just that only one can be transmitted at once. Now we can read the chart like a page knowing the "code". There is a Function column , transmitted , recognized (received) , and a remarks channel. Notice the amps default midi transmit channel is X'ed out. That means the amp does not transmit on a default channel but will be memorized once programmed on the midi edit section on channels 1-16. One needs to set a midi channel on it's first powerup. Notice it will receive anything on 1-16 as desired. In the mode section notice there is nothing transmitted but the modes (altering the default setting in the notes section at the chart bottom) show how recieved data alters the default data already retained. Because we are not dealing with keyboard devices here , the next 4 profiles are X'ed out and the amp doesn't send OR recieve these messages. Just the oposite on the next 3 . Continuous controllers (midi volume pedals, etc ) have preset charts that tell you what type of controller has what CC number. For example CC# 7 assigns a volume pedal which midi data is sent to and received from. CC# 11 assigns a parameter inside the amp effect patch for this pedal. Sometimes reverb depth , delay time , etc. are controlled by the other pedal. Program Change messages 1-127 (128 &129 are ignorned,) This uses the UP/Down (tens) switches and the 0-9 single buttons on the foot controller to change amp patches. We'll deal with the complex world of SysEx TX/RX later. The last 3 rows deal again with keyboard instruments and are not supported by Midi in this device either. Now that wasn't too bad was it ? OK now lets look at the Cyber-Twin Midi pedal MIC and see what it says. This one's gonna be easy. Notice the midi pedal receives nothing. Duh. The pedal is a transmitting device in a nutshell. Find the things that are transmitted and the things that are not. Hint - the keybord stuff pops up again for the no brainer part. Hmmmmmm , notice the info in the remarks section of the CC section ! Now you can see how one device controls another. It's all written in stone. Now for the final exam. Look at this MIC and see how it applies to a very familier device. You might be surprised in a few places. A few minutes looking at one of these charts can save hours poke and peeking at endless midi combinations that will in practice be impossible. Take the time to really check out the MIC chart above. Congratulations , now you know what a lot of seasoned "midi gurus " don't have a clue about. So, if I still don't have a clue, does that make me a seasoned midi guru? I think ya gotta be an engineer or a pilot to get this stuff...Or maybe a bit like my dad, who sez about computers, "...I don't give a hoot about how they work, I just want them to do what I want them to do...and now...."
So, when you flyin' out here to connect my stuff up and play killer keys on my hitherto unreleased "G" tracks? P.S. on a side note, have you ever tried emulating a Vox Continental sound from any of your synths? The Micron? I don't know anything about MIDI but I will check these posts out... I want to know what can do for me. Midi like anything else is best understood in small chunks. I remember the first time I cracked a book about instrument flying , I was totally convinced no one on the face of this planet could absorb over 1000 pages of knowledge to be tested on by the FAA. It was learned in small steps , each one building upon the other. Nine months later I made a 94 on my instrument written and 96 on the instrument instructor written. We'll start putting things together soon. "Making music with midi" should be ready this weekend. Well Geno, your recent salvo of midi posts (which are all splendid by the way) has rekindled my interest in learning another "chunk." For the past few nights I've been working on transport between Sonar, the G and my Drum machine and have less hair on my head to prove it. The G's imp chart suggests that it will not receive tempo data, i.e. I can not alter the G's tempo map in realtime or at all. However there is an asterisk. Any Idea what that's all about? he G's imp chart suggests that it will not receive tempo data, i.e. I can not alter the G's tempo map in realtime or at all. However there is an asterisk. Any Idea what that's all about? The chart does suggest that the G doesn't RX master clock sync. But if you look two rows above notice the G does send AND rx SysEx which includes MMC. So I would write a script for tempo change in sonar? Kind of defeats my goal of using sonar's easy to manipilate tempo map to run the show. There are other work arounds, just wondered about an external source controlling the master clock. Thanks fur the clarification.